So, you’ve recently introduced a cute little furball into your family….welcome to the good life! Raising a kitten sure can be a fun process. And while teaching her how to use the cat litter box can be a bit of a hassle sometimes, it’s certainly an important part of the cat-rearing process. What type of cat litter should you use? Honestly, a lot of pet parents probably don’t even realize there’s a difference between the best cat litter for kittens versus adult cats. The truth is, there are several important considerations to keep in mind when it comes to introducing your young feline to her new kitty litter box. The secret? Not all litters are created equal—and not all are going to be a “best fit” for your tiny carnivore. 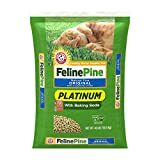 In this review, we’re going to discuss why special kitty litter for kittens is so important, the things you need to consider when selecting the right litter for her, and which brands are the best of the best. 1. Choose non-clumping litter for younger kittens. 3. Avoid large litter granules. All cats are cute, but kittens are cute with the volume turned up! To make sure these little ones are safe and adjusting well as they’re being housebroken, they need to have kitten safe litter in their litter boxes. Like all babies, kitties explore a lot of the world with their mouths and tongues. They instinctively like to lick, nibble, and eat things as a way to learn about them. Yes—this may include kitty litter granules (gross). Because of this, it’s best to use a kitty litter that’s going to be as safe as possible if it’s ingested by your little four-legged kid. Kittens aren’t quite as…ahem…tidy as their grown-up role models. As you teach your sweet feline to use her new litter box, she’ll likely end up making more of a mess than her older siblings. For instance, kitties may not be as effective at cleaning the granules off their paws or bottoms. This means they could inadvertently eat it and track it all over the house. The best cat litter for kittens will generally be one that’s less likely to track or emit dust to attenuate the messy nature of your little cutie. And because your kitty isn’t a pro at cleaning herself yet, you should also make sure the litter you use for her is going to be non-toxic—so it’ll be minimally harmful if she accidentally ingests it during self-grooming. Kittens immune systems aren’t quite as developed as adults. This means they could be more susceptible to potentially harmful substances or have sensitivities to certain allergens, including fragrances and dyes. Until your kitty gets a chance to get older and stronger—and until you get a chance to learn about your kitten’s unique skin sensitivities—it’s usually the best choice to find a simple, chemical-free product that contains as few ingredients or potential allergens as possible. Which kitty litter should I choose? Yes, it’s amazingly convenient and tidy. But is it safe for young kitties? As it turns out, there isn’t any hard proof that clumping litter isn‘t safe for them. BUT if we use some basic logic, we can see how it may pose a problem. Clumping cat litter is designed to congeal when it comes in contact with moisture. Given that your little feline may be more likely to ingest litter than the older and more experienced cats in your family, this could put your feline at risk of obstruction in her digestive tract or urinary tract. So, now we’re clear on why clumping cat litter should probably stay out of your kitty’s litter box for a while. With that covered, let’s roll up our sleeves and “scoop” through some important factors to help us figure out which type of kitty litter is safe for your tiny companion. Clumping litter could cause gastrointestinal distress and blockages if ingested. To play it safe, hold off on introducing her to clumping litter until she’s at least three months old. Again, there’s no clear evidence to say that clumping cat litter isn’t safe for young cats. But erring on the side of caution isn’t a bad idea. Besides, you should allow your kitty to have her own litter box, so even if older cats in your home use the clumping litter, it’s relatively easy to use a non-clumping kind for your littlest one. Cats are highly sensitive to odors (we know—humans can be too, especially if it’s the odor of ammonia, urine, or feces!). But if you’re just training your kitty on a litter box and fill it with a scented litter, the smell may deter her from using the box at all. Definitely not what you want happening. Plus, some scented litters use artificial fragrances, dyes, and other ingredients that could lead to irritation on your kitty’s paws, coat, and skin. Your best bet is to avoid scented litters and instead find an unscented litter that does a great job at eliminating odors without having to cover them up (we go over this in detail in our litter reviews). As your animal gets older and you get to know her unique temperament and sensitivities a little better, you may be able to opt for a scented brand if you prefer. Those adorable little paws of hers won’t feel as comfortable if she has to dig through large litter granules every day! And since you’re trying to encourage her to use her new litter box rather than avoid it like it’s a big scary dog, it’s wise to look for a product that has small granules for improved comfort. Small granules can encourage the normal digging and scratching behavior that a tiny feline needs to do in order to use her litter box appropriately. Plus, given the chance that your pet may try to eat the litter (especially in the beginning when she’s new to it and still relatively young), at least the smaller granules will pose less of a choking or obstruction hazard. Remember how your little cat is learning how to be clean, neat, and tidy? Help her out during this learning process by choosing a litter product that is mostly dust-free. This reduces the risk of respiratory issues for her and you. It also can keep the mess to a minimum by reducing the risk of tracking outside of the box and around the rest of the house. This litter features 100% natural and chemical-free granules, making it both safe and comfortable for a cute little kitty who’s learning how to use the litter box like a big girl! The manufacturers pledge no dust and no tracking, and absorbs liquids fully without clumping to help keep your litter box cleaner and fresher-smelling. This one is on the pricier side, however, and a few owners seem to think this updated version doesn’t work quite as well as an older recipe. This litter pledges paw-friendly and 99.7% dust-free litter particles so it’s more comfortable and safer for tiny kittens. While the odor control may not ideal compared to other products, it’s extremely gentle on tiny paws. 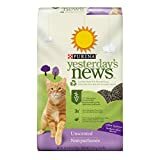 Plus, for any environmentally-conscious pet owners, this product is a great choice because it’s made with recycled newspaper! This litter is non-clumping and offers protection against the three main odors we worry about with litter boxes (ammonia, feces, and urine). It features an “extended-release deodorizing system” for all-day odor control. 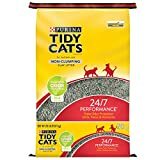 The product is made with montmorillonite clay, but it’s non-toxic and generally safer for little kittens compared to traditional clay litter brands. Unfortunately, some owners find that the product gets “gooey” and hard to clean up because it doesn’t self-clump. This litter is completely natural and made in the USA! It’s formed by crushed walnut shells—a good renewable source for the green-minded pet owners out there. It absorbs fluids and odors pretty well, although can turn a bit mushy, making clean-up more challenging. Don’t let the odd appearance fool you—the odor control is fantastic according to most people who use it regularly (even with multiple cats in the home). One problem experienced by some cat owners is that the pellets can track relatively easily around the home. However, this lightweight feature appeals to a lot of kitties since it’s so gentle on their paws. This litter really does attract kitties, which is a good thing. After all—that’s the point of having a great product if your animals don’t want to use it? The soft texture and low dust quality means your little cat’s paws and lungs will be comfortable using this litter daily. The reviews are overwhelming positive, with a lot of owners even saying that it’s the only kind their kittens will use. 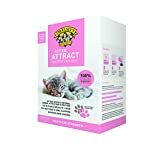 Because it’s effective for all ages, this litter is also great to train your kitty on because she’ll probably be able to continue using it as she gets older. Place your kitty inside the box regularly, especially right after she’s eaten or right after she’s woken up from a nap. When she’s out of the box, reward her with play time or kitten-safe treats! If she naturally begins to dig in the litter—yay! Let her. If she doesn’t, you can try gently moving her paws and seeing if that’ll trigger her digging instinct. Give her some privacy—just like you, she probably doesn’t want someone hovering over her as she tries to relieve herself! Catch your kitty relieving herself outside the box? Gently yet swiftly pick her up and place her inside the box to help her associate the litter box with urinating and defecating. If she does have an out-of-box accident, put some of the waste in her box—it might be a little gross, but the scent can help her find the box in the future. Try using a smaller box for your kitty, and be sure to keep it far away from the litter boxes of the other cats in your home (if you have any). Place the box in a quiet area and leave it there—this will also help her find it and encourage her to use it. It’s best to put it in an area that’s not super high traffic but equally not so far away that it takes her long time to get there. Whether you plan on letting your cat be an indoor only or indoor/outdoor creature, she’ll still need to learn how to use the litter box. And remember: clumping cat litter is super handy to use (especially in a home with multiple cats). Just don’t introduce it to your feline friend until she’s at least 3 or 4 months old when she’s a little less likely to eat everything in sight…and a little better at the whole self-grooming thing! “Scented products emit a bouquet of VOCs” by Carol Potera Environmental health perspectivesvol. 119,1 (2011): A16.